FDIC Limits • Max Blog • Max. your best interest. Max members are continuing to benefit from a rise in rates offered by online banks. This morning, American Express increased the interest rate paid on its Personal Savings online accounts to 0.85%. This comes on the heels of GE Capital Bank‘s rate increase on Monday. For Americans with substantial cash balances, the ability to spread deposits across multiple online banks helps keep larger amounts of cash safe via increased FDIC insurance, while dramatically increasing yield vs. other alternatives, such as brick-and-mortar savings accounts or money market funds. Max makes it easy to manage a basket of these accounts, monitoring changes in interest rates and automatically reallocating cash among your accounts to seek the best combination of yield and FDIC insurance protection. Max charges a small fee of 0.02% each quarter for this service. For months we’ve been predicting a rise in rates, and in turn a widening of the spread between the yield available from the network of online banks supported by Max vs. the national savings average. Max members are now earning a weighted average 0.93%, as compared to the Bankrate.com national savings average of 0.09% or most money market funds that yield only 0.01%. More information about Max can be found at MaxMyInterest.com. 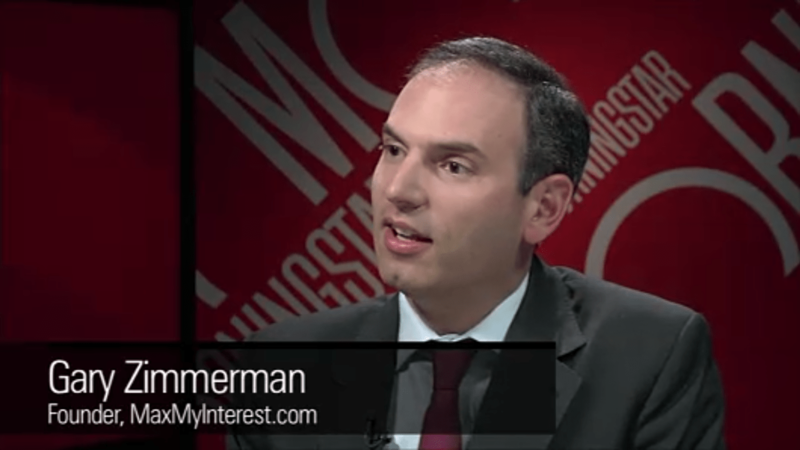 MaxMyInterest founder Gary Zimmerman discusses why investors hold cash with Morningstar’s Christine Benz. Do you hold cash in your portfolio? Of course you do. It’s the universal asset class. Everyone needs some degree of cash to manage their monthly expenses: homes, automobiles, tuition, travel, dining and entertainment. But how much cash is enough cash? Should you hold cash beyond what you need on a monthly basis? And how much are you earning on the cash portion of your portfolio? For most high net worth investors, the bulk of their portfolios are comprised of domestic and international equities, tax-advantaged fixed income instruments, real estate, commodities and alternative investments like private equity, hedge funds or real assets. Yet today, cash represents a substantial portion of the portfolios of both individual investors and family offices. Most of it is earning next to nothing. Forbes Magazine contributor Jim Cahn recently cited a study by US Trust that found that “one-fifth of all high net worth individuals (with $3 million or more in investable assets) are holding more than 25% of their portfolio in cash.” This is consistent with our anecdotal conversations with individual investors and family offices. Sure, we occasionally run into investors who hold virtually no cash, choosing to margin securities when they buy a car or pay tuition. But most investors do keep a meaningful cash allocation. 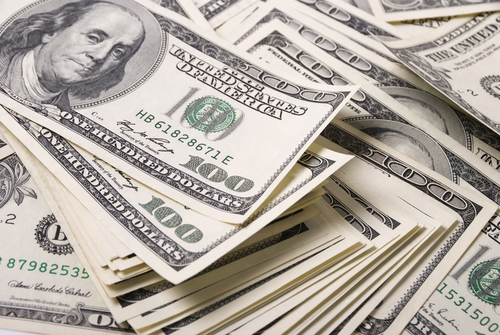 One family office we know is 100% in cash – to the tune of $250 million. For most investors, having a sizable cash cushion helps them manage both personal and portfolio risk. As I discussed in a recent interview with Christine Benz at Morningstar, we all remember the depths of the financial crisis. Most investors prefer to have a cash cushion to withstand economic swings. They also like to have on hand some “dry powder” that can profitably deployed, so that they can, in the words of Warren Buffett, “be greedy when others are fearful.” Cash can serve not only as a hedge, but also as a strategic reserve. Among the most conservative investors are investment bankers, many of whom hold seven figures in cash. Working in a volatile industry, where layoffs accompany each business cycle, it makes sense to hold a rainy-day fund in cash. Law firm partners are similar. One leading private banker told me his white-shoe law firm clients tend to hold between $1 million and $3 million in cash, with one client holding a staggering $20 million, all earning no more than 0.30%. Whether that reflects inertia or a deliberate allocation doesn’t matter – what matters is how clients invest that cash, to ensure it doesn’t unduly drag down the returns of the entire portfolio. At Max, we don’t take a view on how much cash investors should hold – each individual is different, and should consult with his or her financial advisor to determine what’s prudent. However, for whatever portion of your portfolio that you’ve chosen to hold in cash, you ought to earn as much as possible on it, while ensuring that it is safe, insured, and accessible when you need it. MaxMyInterest is a cash management solution that helps investors earn substantially more on their cash, while keeping it safe. Max members are today earning a weighted average 0.89% on their cash, held in their own accounts at leading FDIC-insured online banks such as American Express, Barclays and GE Capital. As interest rates change, Max automatically reallocates cash to help ensure its members benefit from the best rates available. Best of all, Max members need not change the way that they interact with their existing checking account, so direct deposit, bill pay, and access to tellers and notaries remain unchanged. An incremental 0.80% of return can be meaningful, particularly when compounded over time. Savvy investors know that it’s important to monitor every aspect of portfolio risk and return. With Max, investors can generate incremental return without incremental risk, the holy grail of investing. So, much like you wouldn’t put up with a mutual fund that consistently underperformed the market by 0.80%, no longer should you suffer such a fate from cash. We’re all busy, and focusing on cash often falls to the bottom of the To Do list. However, Max was designed so that – after a one-time setup – you never have to think about your cash again. You can just sit back, knowing that the cash portion of your portfolio is optimally invested in your own FDIC-insured bank accounts. 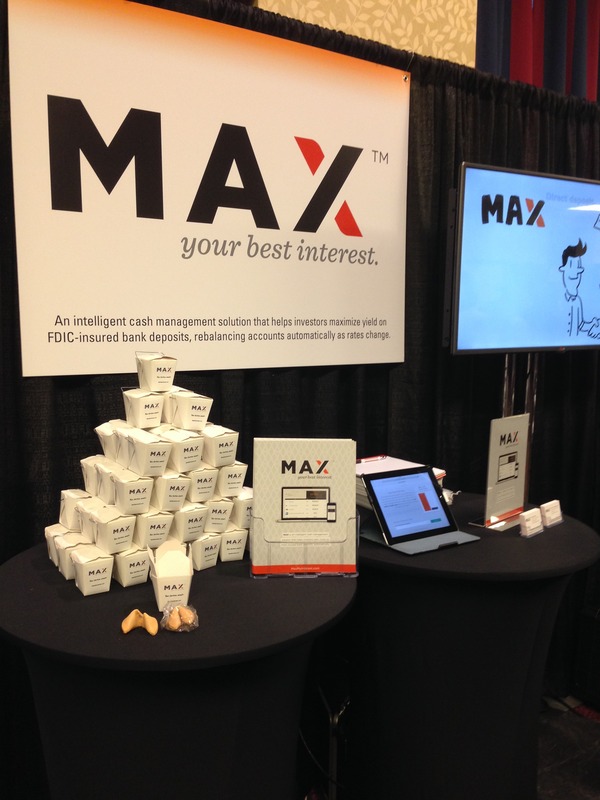 The MaxMyInterest booth at the Finovate conference in New York on September 23, 2014. Is Max too good to be true? How can I earn more money on my cash without paying expensive fees, being subject to stiff restrictions on transferring my money, or maintaining a high minimum balance? Max is not a bank, and Max never takes custody of your funds. Many customers have asked how they can send us money to optimize. With Max, you don’t send us any money. Your money remains in your own bank accounts, automatically moving between your own accounts to where you can earn the best yield each month. There is no minimum balance required to use Max. These are your accounts, so the only minimums are those imposed by the banks. The online banks in our system have account minimums of either zero or $1.00. They charge no monthly fees. The only minimums that might apply are those imposed by your own checking account; often banks will require that you keep a minimum of $1,500 to avoid monthly fees. But Max does not impose any minimum balance requirement. There are no incremental transfer fees associated with the monthly optimizations. Every three months, Max charges a simple fee of 0.02% on the balance that is being optimized in your linked online savings accounts, for a total of 0.08% per year. This works out to approximately 10% of the gain that most members can expect by using Max, while our members keep the remaining 90% of the gain. We don’t charge a fee on the money that’s in your checking account. There is no term to the deposits. These are savings accounts, held in your name, to which you have daily access. The rates offered by these online banks are typically better than even a 5-year CD at most brick-and mortar banks. These rates are so good simply because the online banks don’t have to pay for the costly overhead of branches. This saves them ~1.50%, and they’re passing on roughly half of these savings to depositors in the form of higher rates That’s why most Max members today are earning approximately 0.90%, which is about 0.80% higher than the national savings average and almost 0.90% higher than the yield on most money market funds. Max keeps you optimized automatically. Max doesn’t just tell you what you need to do to earn more on your cash; Max does it for you. The Max system is fully automated, so you set it up once and then Max does the rest. Max monitors interest rates daily, and once a month, instructs your banks to send funds between one another to keep you optimized, maximizing your interest income while staying within the FDIC insurance limits at each bank, and restoring your checking account to your desired balance each month. You can log into Max at any time and see your balances, view the status of each of these transfers, request intra-month transfers via our Intelligent Funds TransferSM feature, and change settings to customize how Max works for you. Come tax time, we plan to have in place a feature that delivers all of your 1099s to you via a single PDF, eliminating the hassle of retrieving a separate tax form for each account you hold. Have more questions? You can reach Max Member Services at member.services@maxmyinterest.com. MaxMyInterest is presenting at the FinovateFall conference this week in New York City. In honor of the conference, which showcases innovative financial-technology solutions, we’re taking a look at the problem that Max solves: people are not earning enough on their cash in the bank, and they’re taking more risk than they’d like by not staying under the FDIC limits on their bank accounts. Cash makes up a reported 40% of Americans’ holdings — far more than most asset-allocation models would recommend. With the stock market at an all-time high, why are investors holding onto so much cash? There are several logical reasons why people would choose a more conservative asset allocation, yet in doing so they’ve missed out on a stock market rally which has been going strong for more than three years. Some investors feel the market is overvalued and are waiting until stock prices fall to buy more. 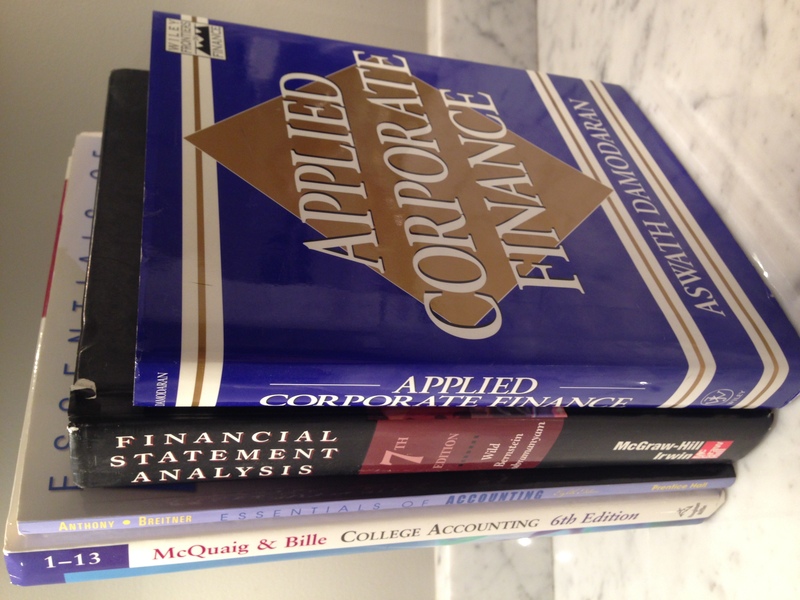 They remember the tremendous buying opportunities that existed at the depths of the financial crisis. Investors who had “dry powder” — cash on the sidelines available to invest — were able to triple their money simply by buying the S&P 500 Index at the bottom and waiting for the recovery to take hold. Many savvy investors employ a strategy called dollar-cost averaging, which reduces the risk of market timing by taking a fixed amount of cash and deploying it methodically in equal installments over several days, weeks, or months. This strategy requires holding extra cash, because it takes some time to accumulate the position that the investor ultimately wants to hold. Investors’ appetite for cash also depends on how old they are. For millennials, who came of age during the 2008 global financial crisis and the recession that followed, the equity markets are viewed to be perilous. Many investors in this age bracket are ultra-conservative in asset allocation and don’t want to own any stocks at all. As a result, they keep a larger proportion of their assets in cash than people their age usually do. According to a recent Forbes article, 40% of millennials favor cash over any other asset class. Investors approaching retirement tend to hold a larger portion of their portfolios in cash and fixed income instruments — but with interest rates expected to rise, holding long-term bonds could be a losing strategy, so many of these investors have pulled cash from bond funds, hoping to preserve its value better by keeping it in cash. One investor who’s holding lots of cash is Warren Buffett, whose Berkshire Hathaway has $55 billion in its corporate bank account. Buffett knows that opportunities are out there, and cash gives him the freedom to scoop them up when they become available. As we wrote earlier, Buffett has historically saved up cash when the markets rise, and spent it quickly when the markets fall. He is perhaps the ultimately market timer. The trouble with keeping a large percentage of your portfolio in cash is that cash provides little, if any, real yield, often underperforming inflation. Many investors also grapple with the limits of FDIC insurance, which only cover the first $250,000 per depositor, per account type, per bank. For investors who hold cash in money market funds (as is often the case in brokerage accounts), they are not even covered by FDIC insurance, meaning their cash could be at risk. For Max members, holding cash on the sidelines becomes less of an issue. 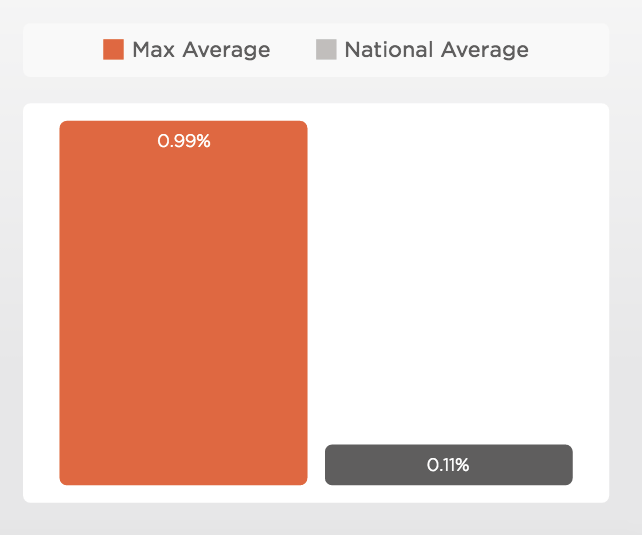 Max members are currently earning a weighted-average 0.88% yield on their cash, far more than the national savings average of 0.11% or most money market funds that yield a paltry 0.01% today. Even in this low-interest-rate environment, that means Max members are earning 8 times as much as the average bank customer on cash deposits. While each investor should make his/her own determination as to how much cash to hold, at least via Max, they can rest easy knowing that they’re earning as much as possible on that cash, so that there’s more of it at the ready when the next investment opportunity presents itself. School’s back in session, so it’s time to take a look at your finances. In school you learned how to get the highest score on a test: first answer all the questions you know, then go for partial credit on the harder ones. Your family’s portfolio can work the same way, first focusing on the decisions that will have the biggest impact and then searching for ways to enhance your returns on the margin. Here are three ways to streamline your finances so that your money works harder for you. Picking individual stocks is tough; even the pros often can’t select winners. Statistically, investors who try to bet on individual companies rarely beat the market. But many people keep trying to pick individual stocks because they’ve read the fairy tales about others who have built fortunes on one stock. Unfortunately, unless you invest in a company early on and it becomes a stock-market juggernaut, you are unlikely to amass a huge profit from just one holding. The more conservative way to invest in equities is to buy low-cost, broad-market ETFs and to hold on to them for many years, dollar cost averaging into your position over time. That way, you diversify your risk among a large number of stocks without trying to time the market, while keeping your costs low. Why do fees matter? This is one of the areas where investors have a chance to make a real difference in their results, regardless of how the market performs. Every dollar you spend today paying fees – on your funds, your bank accounts, or your investment adviser’s services – is a dollar that won’t compound in your portfolio over time. The power of compounding is what makes a portfolio grow in a steady, reliable way for most investors. Fees aren’t inherently bad — what matters is the performance of your investments net of fees. If you have a stock fund or a financial advisor that consistently outperforms the market, it may be worth the extra fees. The problem is that with equities, it’s difficult to find someone who can consistently outperform the market by a wide margin year in, year out. If you’re paying 1.0 – 1.5% in fees each year, that can put a real drag on your returns over time. There will always be some portion of your portfolio that you choose to keep in cash, typically held in your bank account or in money market funds. If that cash on the sidelines isn’t earning as much interest as it could, you’re leaving money on the table. Just like with high fees, earning little interest on your money in the bank puts a drag on your portfolio — money that could otherwise be compounding over time. MaxMyInterest.com offers an investor-friendly system that helps you consistently earn more on your cash by helping take advantage of the higher yields offered by online banks. Today, these yields are as high as 0.95%, considerably higher than the national savings account average of 0.11% or most money market funds that yield a paltry 0.01%. By monitoring for changes in interest rates, and automatically helping your money move to the leading FDIC-insured banks offering the highest rates each month, MaxMyInterest can help you earn higher yields on your cash, boosting the returns on this portion of your potfolio. Sitting on a lot of cash? Make sure it’s fully insured. Banks are the safest place to keep your money — until they’re not. It’s a remote risk, but bank failures do occasionally happen. It’s important to ensure your cash is adequately protected, before it’s too late. That’s why deposit insurance exists. In the U.S., the government’s FDIC insurance program guarantees the first $250,000 of a depositor’s cash in each insured bank. But many depositors hold much more than the FDIC limit in cash, leaving a portion of their cash at risk in the unlikely event of a bank failure. Investors keep a portion of their financial assets in cash precisely because they don’t want to take risk, so it makes sense to ensure that as much of your cash as possible is protected by FDIC insurance. FDIC insurance tops out at $250,000 per depositor, per account type, and per bank. If you set up an account for yourself, one for your spouse, and one held as a joint account in both of your names, together you now have $1 million in FDIC coverage at that bank: $250,000 for each of your individual accounts, plus another $250,000 for each of you for the joint account. The largest national banks often have more than one bank charter. This means they can offer their account holders the ability to have accounts at what’s technically more than one bank. Because FDIC coverage applies per bank, this can increase the deposit insurance that account holders can receive. If you hold $750,000 at a bank that has three bank charters, you may be insured under FDIC rules for the entire balance. Ask your bank if this applies to your accounts and read the fine print to ensure you are adequately protected. To make sure your cash in the bank is insured, you can open accounts at a variety of banks. That way, even if one bank fails, you’ll still have access to your accounts at the other banks. Be sure to keep your accounts below the $250,000 FDIC coverage limit at each bank. As you spread your accounts among different banks, consider online banks as well as traditional brick-and-mortar banks. Savings accounts at online banks often pay considerably more in interest, because they don’t have to support the same level of expenses for branches or tellers. Just be sure to monitor the rates your banks are paying, so you can make certain you’re getting the most interest you can. Banks change their rates frequently. If you’d like a solution to help you manage your existing brick-and-mortar checking account along with online savings accounts, while optimizing the amount of interest you earn, try our service, called Max, at MaxMyInterest.com. Max uses the links between your brick-and-mortar checking account and your online savings accounts to optimize the amount you earn in interest on your cash in the bank, while respecting FDIC limits. That means that your money automatically moves between your own accounts to stay within the FDIC limits at each bank, while helping you earn as much interest as possible, even as rates change. As an alternative to bank accounts, many investors choose to keep cash in money market funds. This is especially prevalent within brokerage accounts. However, shares of these funds aren’t insured, which means they could potentially lose value. During the global financial crisis, one such fund, the Reserve Primary Fund, dipped below $1 per share in value, sparking an exodus from this class of investments. Since then, Americans’ investments in money market funds have fallen from $4 trillion to $2.7 trillion today. One downside of money market funds: many of these funds currently yield as little as 0.01% annually. By contrast, bank accounts typically pay 10 times that much in interest and online savings accounts managed through the MaxMyInterest.com system are yielding approximately 80 times more, even after taking fees into account. Max members are currently earning a weighted average of 0.87%, or 0.79% net of fees, all via FDIC-insured savings accounts at leading online banks including American Express, Barclays, GE Capital, Ally Bank and Capital One 360. Gary Zimmerman is the Founder of MaxMyInterest.com.